According to studies and writings about STEM education at its onset, certain criteria and principles would be common to STEM lessons and programs. Consider how these criteria match up with some of the most popular approaches to STEM in U.S. schools today. This information might be useful if you and your fellow teachers are called on to help design or set up STEM programs and classes. Remember, good science, math and technology programs can have many different “looks,” but if we’re going to call a program “STEM” then these eight STEM criteria should be at the center. An engineering design process is used to integrate science, mathematics, and technology. Science and math content is standards based, grade-appropriate, and applied. Students focus on solving real-world problems, or engineering challenges. Students regularly work in teams to plan, design, and create prototypes and products, then test and evaluate these and plan how to improve. Students use a variety of communication approaches to describe their challenge and justify their results. 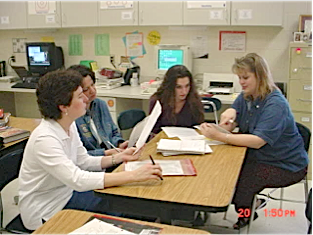 Teachers facilitate inquiry-based, student-centered learning that features hands-on investigation. Failure is regarded as a natural part of the design process, and an essential step toward creating an improved or successful solution. Students are introduced to STEM careers and/or life applications. Leaders must be familiar with the purpose of STEM and the essentials of a quality STEM education program. They must be clear about what outcomes they expect from their STEM program—then provide teacher development, resources, and an environment that allows this learning to happen. Note that these are not the only criteria, but these elements can be used to identify STEM programs in schools and will be part of the practices in STEM classrooms. Also notice that these criteria are intentional—they are not left to chance. For example, students are not thrown together in teams with the hope that they will be productive. Helping students learn to work together productively is a goal of STEM curricula, as important as any other goal. From Chapter 3 of STEM by Design by Anne Jolly (Routledge 2017). All Rights Reserved.